Situated on the border between deadpan irony and high seriousness, The Institute of Failure is dedicated to the documentation, study and theorisation of failure in all aspects of human endeavour. Existing as a website and through occasional live presentations, the Institute is a think-tank preoccupied with questions: What is failure and what are its uses? How, why and when can we say that something fails? Headed by Etchells and Chicago-based Matthew Goulish, the Institute aims to map the face of contemporary failure – deliberate or otherwise. In cross-disciplinary style, the project brings together artists and writers from fields as diverse as fine arts, economics, computing, architecture and performance. The Institute of Failure currently plays host to the inaugural papers by Etchells and Goulish as well as a diverse and growing collection of other materials which take us into a world of broken lifts, personal disasters, historical catastrophes, bridge collapses, absurdist documentation and philosophical arts projects. Recent additions to the website range from the conceptual slapstick of Howard Matthew’s Manual of Assisted Appliances, including plans for a self-assembled collapsing chair, to Sara Jane Bailes’ distracted writing on distraction. 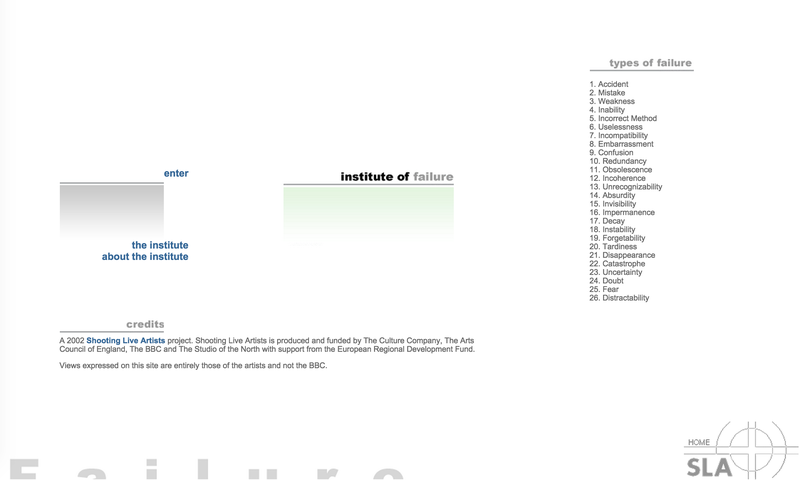 The Institute of Failure was originally a Shooting Live Artists 2001 project funded by the BBC and Arts Council England.